Speak no more of the glacial epoch as 80,000 years agone. The glacial epoch is ahead. Sir Robert Ball says that the next ice age is due in 200,000 years. In the course of long periods the earth's orbit round the sun changes from being nearly a circle, as it is now, to a long ellipse or oval, and in the last case the summer may be only 166 days long, while the winter lasts 199 days. There is a short hot summer, followed by a long, excessively cold winter, so that more ice is formed in the cold than can be melted in the warm season. On purely astronomical grounds, even if geologists had not discovered the ice ages from the records of the globe's surface, astronomers would have demonstrated that ice ages must have happened. When the next chilly epoch arrives posterity may see all Northern Europe under an ice-cap that will o'ertop the highest mountains and last for many thousands of years. An anthropogenic release of 300 Gton C (as we have already done) has a relatively small impact on future climate evolution, postponing the next glacial termination 140 kyr from now by one precession cycle. Release of 1000 Gton C (blue lines, Figure 3c) is enough to decisively prevent glaciation in the next few thousand years, and given the long atmospheric lifetime of CO2, to prevent glaciation until 130 kyr from now. If the anthropogenic carbon release is 5000 Gton or more (red lines), the critical trigger insolation value exceeds 2 σ of the long-term mean for the next 100 kyr. This is a time of low insolation variability because of the Earth's nearly circular orbit. The anthrogenic CO2 forcing begins to decay toward natural conditions just as eccentricity (and hence insolation variability) reaches its next minimum 400 kyr from now. 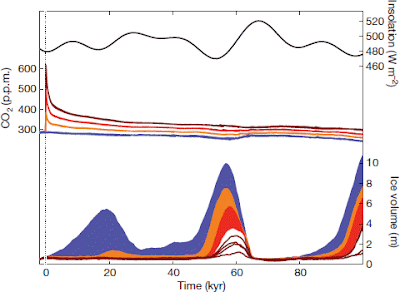 The model predicts the end of the glacial cycles, with stability of the interglacial for at least the next half million years (Figure 3c). The point is, a small change in insolation can have a big impact. That's because of the feedbacks. When the forcing is because of slight changes in tilt or wobble it affects the ice cap, which warms or cools the world, which causes more or less CO2 from the ocean to the air and vice versa, which raises or drops the temperature more. The main feedback that causes the warming or cooling is the change in carbon dioxide. A change in atmospheric CO2 has its own feedbacks like water vapour. All these changes then act together to warm or cool the planet. In this latest paper in Nature, the authors, A. Ganopolski, R. Winkelmann & H. J. Schellnhuber, are suggesting that if we keep going the way we are at present, even if we stop after emitting 1500 Gt of carbon (twice as much again as we've already added to the air), we'll still have a significant impact on climate one hundred thousand years into the future. We'll probably avoid completely the next ice age that would have been due, and significantly diminish if not avoid the one after that. Under three scenarios with cumulative emissions of 500 gigatonnes of carbon (Gt C), 1,000 Gt C and 1,500 Gt C, we simulate the ice volume on the Northern Hemisphere for the next 100,000 years. Even for a total of 500 Gt C cumulative emissions, which is only slightly above the present-day value, the evolution of the Northern Hemisphere ice sheets is affected over tens of thousands of years (Fig. 4). In the 1,000 Gt C scenario, the probability of glacial inception during the next 100,000 years is notably reduced, and under cumulative emissions of 1,500 Gt C, glacial inception is very unlikely within the entire 100,000 years. Unlike most people, including those at WUWT, David doesn't like the colloquial use of ice age, and insists on using the term in the geological sense. That won't please all the WUWT-ers who normally use the term in the popular sense when they voice their alarm that we are about to head into a new ice age ... any day now. His nitpick notwithstanding, it's not yet clear why words failed him to the extent that he couldn't write any of his own and had to copy large slabs from other people. 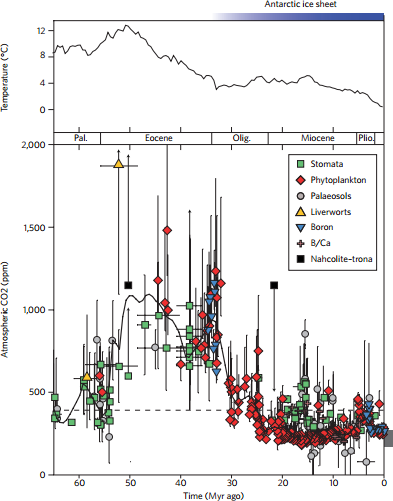 The box in the lower right of the chart indicates it is from Zachos et al (2001). It isn't, but it's based on the same data. Here is the version shown in the paper itself for comparison. You can click on the image to enlarge it. 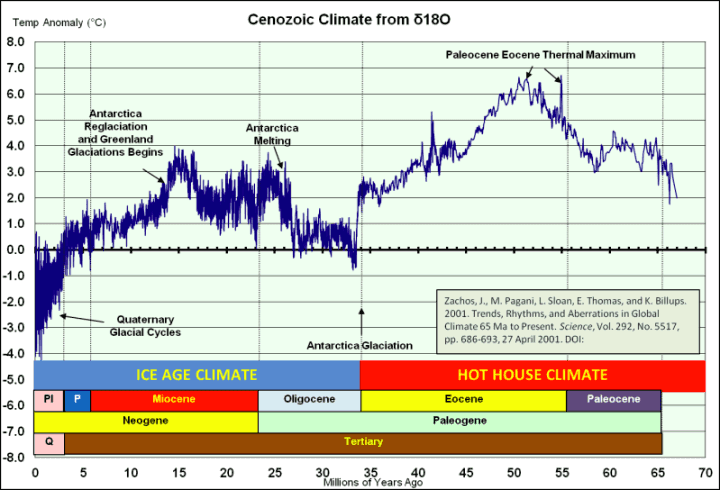 The part on the left is what is shown in the WUWT chart, except it's shown vertically, the δ18O(%) is used as an indicator of temperature over the past 70 million years. Humans only occupy the period to the first mark on the left hand side. Not the 10 but the very first mark indicating 2 million years ago. We are used to a cooler world than that experienced by species that emerged ahead of us. The reason David put it up was apparently because he wanted to point out that we are still in the ice age that's been here for the past 36 million years or so. Now you know and I know that there are good estimates of CO2 going back 800,000 years from ice cores. They show that we already exceed those levels by a wide margin. Now David Middleton and other deniers might not be concerned that we have entered unknown territory. It's virtually certain that never since humans evolved has the earth had greenhouse gases at these levels. It's likely that never in at least multiple millions of years has the pace of heating been this fast. There's really no period in history that mimics what's happening today. Sure it was hotter in the past than it will get in the next few decades, but there was a lot that was different back then. Not least of which was there were no people, no agriculture, no global trade - and even the continents were in different places. Does David Middleton pick cherries? Sorry for the diversion. I said that there were some oddities in David's article. One thing is that David seems to be arguing something or other about the science being suspect. I can only guess that, because he doesn't say what he is arguing anywhere that I can see. Thing is, that both the above charts that he draws on are by scientists who understand what drives climate. Much of the higher frequency change in climate (104 to 105 years) is generated by periodic and quasi-periodic oscillations in Earth's orbital parameters of eccentricity, obliquity, and precession that affect the distribution and amount of incident solar energy (Fig. 1) (1). Whereas eccentricity affects climate by modulating the amplitude of precession and thus influencing the total annual/seasonal solar energy budget, obliquity changes the latitudinal distribution of insolation. Because the orbital parameters vary with distinct tempos that remain stable for tens of millions of years (2), they provide a steady and, hence, predictable pacing of climate. The orbitally related rhythms, in turn, oscillate about a climatic mean that is constantly drifting in response to gradual changes in Earth's major boundary conditions. These include continental geography and topography, oceanic gateway locations and bathymetry, and the concentrations of atmospheric greenhouse gases (3). The question is, does David Middleton accept the above or does he only pick the bits out of the paper that he likes and rejects the rest? Again I ask, does David Middleton accept the above or does he only pick the bits out of the paper that he likes and rejects the rest? They basically developed a model relating insolation to atmospheric CO2. If I am reading it correctly, they are asserting that insolation drives changes in atmospheric CO2 which then drives the glacial-interglacial stages. Can anyone see what David Middleton is trying to argue? I can't. He is reading the science correctly. What he thinks "they are asserting" is old science. It's not new. It's the Milankovitch theory, which you are probably familiar with, and which was even hinted at by Sir Robert Ball back in 1906 (before Milankovitch), and is described in the passage above from Zachos01. As you can imagine, the dullards at WUWT have various conspiracy theories about all this, and are full of the usual denialist contradictions. An underhanded way to support the establishment’s scam. This is ludicrous!! We prevented the ice age (during an ice age) with a puny amount of carbon dioxide!! We are super heroes!! SuperCO2!! They never say the ice age will delay the warming. Wonder why? 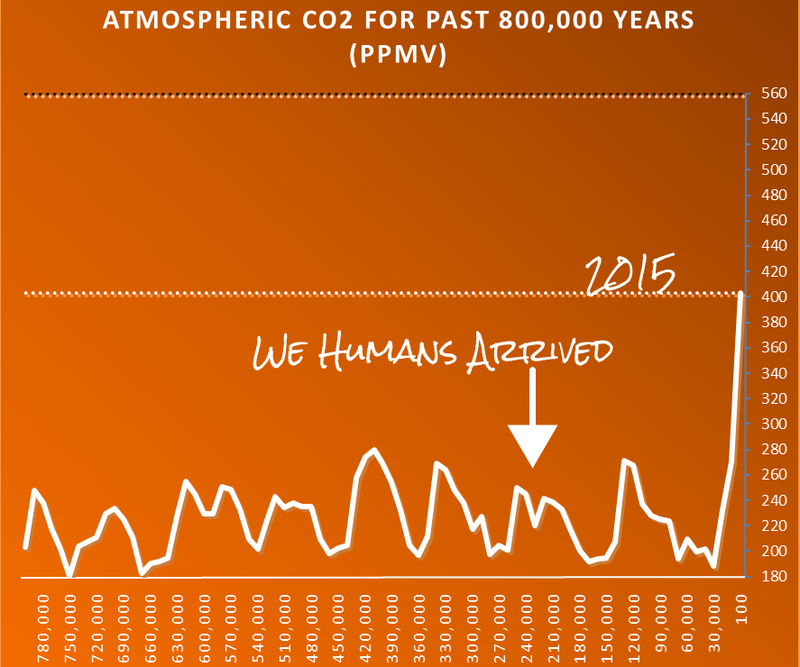 Ever notice how CO2 is at its peak just prior to re-glaciating, during each inter-glacial period? So how come in your graph, if high CO2 levels lead to high temperatures, please explain why temperatures drop from 130 to 110 KYA, when CO2 levels are at their highest? Talk about a Pause!! 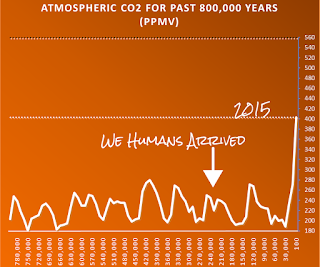 Forget 20 years, we a talking about 20 thousand years of dropping temperatures with high CO2 levels!! willhaas is playing "stupid", a favourite pastime at WUWT. Forget the science. The Paris Climate Agreement abolishes all forms of climate change, extreme weather events, and sea level rise for now and for all time and we here in the USA do not have to pay for it because we are a poor nation with a large national debt, trade deficit, and unfunded liabilities. Apparently the powers that be have found some way to intimidate the sun and the oceans into providing the ideal climate for everyone, everywhere, all the time. richardscourtney could be playing the same game of "stupid", or he might have donned his disinforamation hat. Does he really think that CO2 levels are back to 280 ppm? OCO-2 shows CO2 levels around 400 ppm. Richard is dreaming or deluded. “In typical terrestrial temperatures, water precipitates out of the atmosphere after a short residence time. CO2 does not. Nonsense! The OCO-2 data indicates a CO2 residence time of less than a year. And that is supported by the sequestration rate of the pulse of additional CO2 inserted from phytoplankton into the atmosphere in 1989 which was sequestered in three years: a ‘half-life’ of 6 months removes 98% in three years. I remember reading a book about ice ages while I was still at school back in the 70’s. In it there was a theory that the Earth had to get warmer first in order to increase humidity, before extra snow cover triggered the ice age. Bloke, the theory, as I remember it, was that warming would continue until the Arctic Ocean lost its ice cover, and then the exposed sea surface would provide water vapor to supply sufficient snowfall on the surrounding land to last through the cloudy summers. The Earth would then cool due to the increasing albedo caused by the ever increasing and spreading southward ice sheets. I know you got something to say, but you are not saying it. You get picked apart by all the lurkers, and then your post lives forever on the internet. So what, at least you spoke up. These guys were trained in science? James at 48 is scared he's going to be sent to a fascist camp to be deprogrammed. Some of the more extreme warmistas contemplate fascist states that would put skeptics in camps, “de-program” them or even execute them as punishment for AGW. Well, that knife can cut both ways. Imagine the pitchfork carrying mobs if after proclaiming impossibility of the end of the interglacial, the end was reached either on a “natural” time frame or perhaps one hastened by “AGW mitigation?” Yes, that knife can cut both ways. Complete nonsense. Here are the facts. ...c. If man is beginning to effect the climate, it is more to do with industrial soot on the ice sheets (and possibly farming dust, when the fields are bare all winter). It is dust-ice albedo that controls the feedback of ice ages and interglacials, not CO2. So this proposal is wrong at all levels. What amuses me is the assumption that deferring a new ice age is a BAD thing. Flashback to 1906 - another ice age coming... An article in the The North Western Advocate and the Emu Bay Times, Tasmania, Australia - Saturday 18 August 1906 - in which Sir Robert Stawell Ball FRS predicted another ice age in 200,000 years. I have no idea what he is trying to argue. Anyway, as far as normal people are concerned, deferring ice ages is probably a very good thing. We don't really want them. Fossil fuel reserves are potentially valuable for long term climate stabilisation, if used sensibly. We just happen to be at a point where we've done enough deferring of ice ages for the moment, thank you very much, and should now be worried about deferring another PETM (which wouldn't be "P", but you know what I mean). I wonder if we're going to go down in the palaeontological record as the Anthropocene Thermal Maximum (oh vey, it were a tad warm back then). 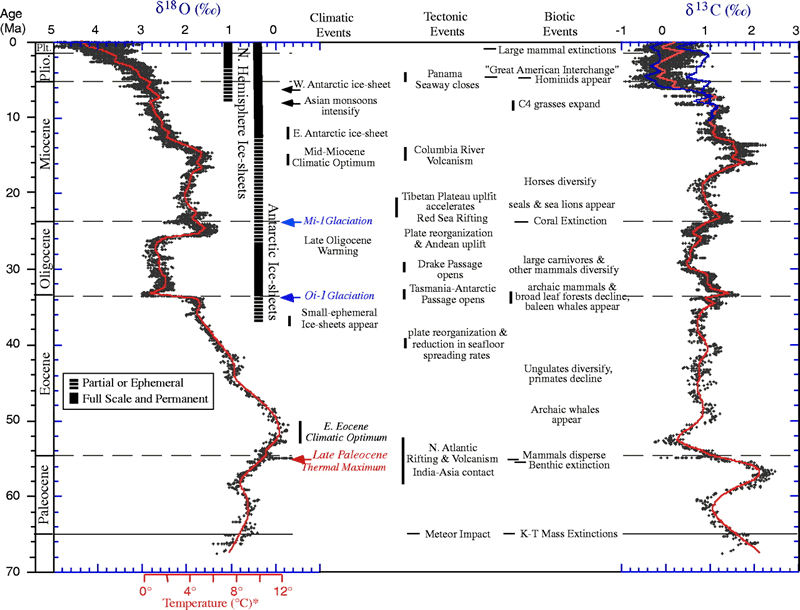 Anywho, I pointed out that actually the paper is saying that because of where we are in the orbital forcing cycle, the Holocene is actually better than it has been any other time in the past 800 kyrs and likely would be pretty good for the next 100 kyrs absent our influence. He only locked onto the things I agreed with him on though, which were ticky-tack puzzlings over how some stuff in the abstract was worded. Ultimately, the piece ended up being fodder for the usual repetitive talking points, logic be damned if they have anything directly relevant to the actual substance of the paper itself. On the plus side, Richard S. Courtney claimed my third irony meter of the year calling me arrogant. David's got another one out today about the PDO, which includes this gem: "Firstly, the Pacific Decadal Oscillation doesn’t drive anything; so it could not be 'playing a role in record-breaking warmth.'" Oh ok, so you're saying we haven't actually done much deferring anyway? So we can just go back to worrying about having our arses roasted. Oh ok, so you're saying we haven't actually done much deferring anyway? The past rapid growth of Northern Hemisphere continental ice sheets, which terminated warm and stable climate periods, is generally attributed to reduced summer insolation in boreal latitudes1, 2, 3. Yet such summer insolation is near to its minimum at present4, and there are no signs of a new ice age5. I scaled the Vostok temperatures 50% to account for polar amplification. So my very rough back-of-envelope, not-robust estimate based only on these data is that our CO2 contributions have put us about 0.5 K above where we'd expect to be based on Milankovitch forcing alone. I don't disagree with these authors that we may have deferred the next "scheduled" glaciation, in my mind that was already pretty well established by prior works. I do have a niggling question that our emissions averted a "full-blown" ice age this cycle. Like I said previously, I think it's kind of a ticky-tack objection, but FWIW there it is. It seems like he knew he had to write something about it because it involved typical arrogant climate scientists making sweeping predictions of catastrophe. The angle we are meant to take the Carlin piece I think is that of 'we are powerless to do any of this' but the idea of avoiding an ice age is quite attractive (even though is wasn't due for millennia) and involves accepting the power of CO2. The result means trying to pull an odd balance of not saying anything clearly. He is a victim of trying to satisfy everyone who is against action on CO2. Better go short on mammals. "Here's a tip. Don't invest your retirement savings in mammals." Not large ones at least. Absent immediate and profound cultural change, humans are almost certain to instigate the demise of much (if not all) of the remaining high-end megafauna on Earth.